Politarchopolis is Lochac’s seventh Barony, and is based in Canberra, Australian Capital Territory, Australia. The group was initially formed as a Shire in January 1984 (AS 18) under the name Politikopolis with Agvar Guyvanaspar as the first Seneschal. Despite being a large group for a long time, Politarchopolis resisted becoming a Barony for several years as they wanted to become a city state instead. The Shire was eventually elevated to Baronial status on 1 July 1995. 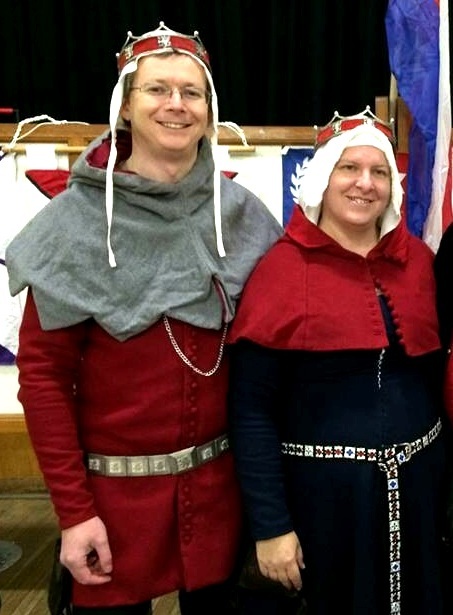 Stephen Aldred and Mathilde Adycote of Mynheniot are Baron and Baroness Politarchopolis – that is, the founding Baron and Baroness. The Barony of Politarchopolis has various communication mediums, including their website, an email list and a facebook group. The newsletter of the Barony is called Griffintayle. Despite being a large group for a long time, Politarchopolis resisted becoming a Barony for several years. In early 1993, the Shire was discussing options for group advancement, with the strongest pushes being for either becoming a Chartered Town (instead of becoming a Barony) or choosing to do nothing and remain a Shire. Late that year, an election was held for the advancement, three couples stood –Sir Gareth of Greymarch and Viviane de Burgh, Charles of the Park and Francesca Cellini, and Dafydd ap Donal ap Gwilym and the then Seneschal Isabeau Chanteuse. The election was held on a weekend at a park, and Stephen Aldred and Mathilde Adycote were the returning officers. The ballot was accompanied by a market day and general activities. During the voting, extra ballot papers “mysteriously” appeared and by “careful” distraction of the returning officers the ballot box was bulging by day’s end. All was not lost, however, as it seems that the ballot box stuffers were colourblind and the tally of checked voters aligned with the number of approved red ballot papers in the ballot box. Blue, green yellow white and other coloured ballot papers were discounted from the official count. At the end of the day, Daffyd and Isabeau were announced the narrow winners (by 2and 3 votes respectively) over Gareth and Viviane, and Charles and Francesca. Twelve months later, the advancement papers had still not been submitted and the Society Seneschal passed word back through Prince Brusi Anderson of the Shetlands that the poll result was now invalid by age. The populace was then re-polled on the matter of advancement, specifically on whether that advancement was preferred to take form as a Barony or a Chartered Town. Advancing to Barony was the decision resulting from the poll, and a third poll was called to decide on who the first Baron and Baroness might be. In that poll Dafydd ap Donal ap Gwilym and Isabeau Chanteuse stood again, and Stephen Aldred and Mathilde Adycote of Mynheniot also stood. The third poll was held on a winter’s day on Carillion Island in Lake Burley Griffin. It was again accompanied by a Fair Day and Tournament. The votes were tallied at the end of the day, and Stephen and Mathilde were announced as the clear victors, becoming Baron and Baroness elect. As such, Stephen and Mathilde were tasked with running the advancement process. At the time the advancement process was taking place, Politarchopolis was the largest group in Lochac with well over 100 active members, and it was said to be the largest Shire in the Known Worlde (though that may just have been speculation). 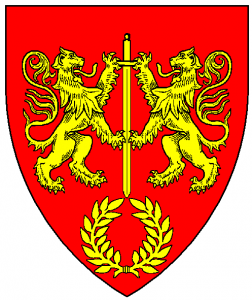 In any case, the papers were submitted and passed to the West Kingdom Seneschal for endorsement and the formal approval of advancement was announced in Lochac during the Principality reign of Prince Bran of Lochiel and Princess Cairistiona nic Bheathain. The advancement petition was formally presented to the Crown of the West at Rowany Festival 1995, making it the second successive Festival where an advancement petition had been submitted (the other being for Ynys Fawr the previous year). 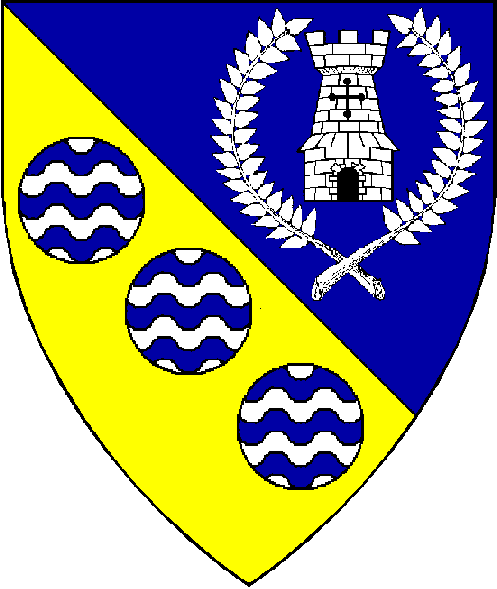 The Shire was finally elevated to Baronial status on the 1st of July 1995 in the Queanbeyan Town Hall (NSW). This was the same hall that Lochac’s First Coronation was eventually ran at (these being the only two times to date that this venue has been used by the SCA). Prince Peter du Gant Noir and Princess Muirghein ni Ghrainne presided over the advancement, and the event was attended by all of the then sitting Barons and Baronesses of Lochac (which made for a rather large High Table). Much fun and merriment was had, including (rather late in the evening) choral renditions by the Barons’ choir (the Landed Barons). The lead up to the event did not go entirely smoothly. The award tokens for the Order of the Burley Griffin were not ready and so on the night before the event Princess Muirghein calligraphed a scroll for the first recipient – Francesca Cellini – and the soon to be Baron Stephen acid etched further tokens for recipients on the second day. The Great sword of state was somehow left behind and the messenger sent to bring it could not unlock the house, so a great sword was borrowed from a wayfaring Scotsman and the Baronial oaths were sworn on it. The Seneschal at the time Lorenzo D’Erudito went forward and petitioned the Crown to elevate Politarchopolis to a Barony. The Coronet then called the populace forward and asked their opinion. On mass affirmation Lorenzo was asked if there were suitable people in the populace to take the arduous task of Baron and Baroness and again by popular acclaim Stephen and Mathilde were named and called forward. During their first Court, Stephen and Mathilde appointed a guard and opened some of the Baronial Awards. Squire Hugh the Little was appointed Baronial Champion, Squire Vladimir Ivanovitch Kurgan was appointed Baronesses Champion, Squire Brennan Halfhand was the inaugural Sergeant of the Guard, all three have since been awarded the accolade of knighthood. The Order of the Burley Griffin was inaugurated as was the Order of the Cordon Rouge. The Cordon Rouge is the highest award offered by the Barony and is only issued once per year. At the investiture court one was given for each year of the Politarchopolis’existence an incomplete list reads – Agvar, Kiriel, Isabeau Chanteusse, Charles of the Park, and Cristoval Gitano. At the first Baronial event after investiture the Order was also conferred on Sir Brusi Anderson who had been unable to attend investiture, and the order was then closed to no more than one per year. On the 2nd of July 1995, a tourney and revel was held at the ANU. The first bout of the tourney saw the new Baron Stephen crossing swords with Prince Peter and, as is right and proper, Prince Peter was victorious. It was one of those glorious Canberra mid-winter days and although cold it was beautifully sunny and clear. At their Sunday court Stephen and Mathilde added additional members to the Order of the Burley Griffin (which is given for Arts Martial, Arts and Sciences and Service), and inaugurated the Orders of the Griffin’s Egg (children’s award) and the Griffin’s Wing (for wayfarers who contribute to Politarchopolis). The Baronial Coronels have eight points and under each point is a Burley Griffin. The Coronels were designed by Francesca Cellini and using the advice of Tovye and Aislinn (the founding Baron and Baroness of Innilgard) were made light. The Coronels were made out of silver by Loyola Juan Sanchez Mendoza, who cast an extra Burley Griffin that Politarchopolis has used to cast tokens in lesser metals (for example, pewter) for the order of the Burley Griffin. Free Citizen of Politarchopolis which has no token but offers the recipient free entry to Politarchopolin events. The inaugural recipient of this award was Owen van Norden for making and gifting the Baronial Sword of state. At that time Owen lived in St Florian and had no plans to move to Politarchopolis. He has since moved into the Barony. The Politarchopolis – St Florian alliance (also referred to as the Axis of Evil) was forged and for all but one year of his Baronial tenure Baron Stephen led one of the armies at Rowany Festival. This was spawned by the Politarchopolis/St Florian fine food contest which St Florian made the first entry to at a winter coronation. At that event Baron Stephen accepted the St Florian challenge and replied with a calligraphed Marzipan scroll (which was delivered into court in a pizza box) so that St Florian’s could eat his words. The Politarchopolis event was the Good Food Feast, ably stewarded by the Politarchopolis assault catering corps. Border War also began during that time with Baron Rudolph of Stormhold and Stephen breaking arrows and issuing challenge. Table top trebuchets were introduced to local feasts and all in all much fun and merriment was had. The full list and dates of all reigning Barons and Baronesses (also known as Landed Gentry or Landed Barons and Baronesses) are listed on the Canon Lore website under Politarchopolis. Politarchopolis has had six reining Barons and Baronesses between 1995 and 2014: Landed Gentry of Politarchopolis. The current Baron and Baroness are Master Crispin Sexi and Dame Joan Sutton. Crispin Sexi and Joan Sutton, sixth Baron and Baroness of Politarchopolis. Photo by TH Lady Ceara Shionnach, 2014. The name of this Barony is a play on the fact that Canberra is the capital city of Australia, and the home of Australia’s Parliament House. 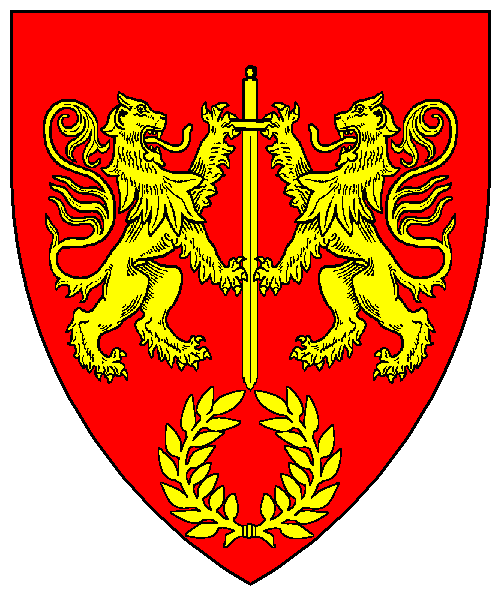 Argent, on a pale gules a griffin segreant argent, overall a laurel wreath counterchanged. 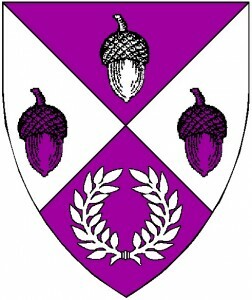 Arms of Politarchopolis, as rendered by Baron Master William Castille. The device has two elements distinctive of the region – the griffin is a play on the name of Walter Burley Griffin (the architect who designed Canberra) and the red stripe is a play on the concept of red tape (another link to politics). The Canton of Torlyon is based in the Yass, NSW region. The group was initially a Shire, however, it transferred to a Canton of Politarchopolis on 20 June 2015 at Bal d’Argent AS 50. Arms of Torlyon, as rendered by Baron Master William Castille. The Canton of Okewaite encompasses the Southern Highlands from Mittagong to Goulburn, New South Wales, Australia. 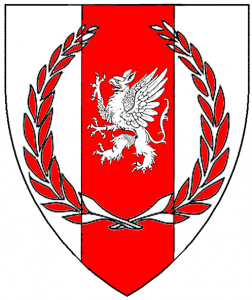 It was originally a Canton of the Barony of Rowany, however, the group was officially transferred to Politarchopolis on the 25 March 2016 at Rowany Festival AS 50. The registered arms of the Canton of Okewaite, rendered by Baron William Castille. The College of St Aldhelm is based at the Australian National University, located in Acton, Australian Capital Territory, Australia. 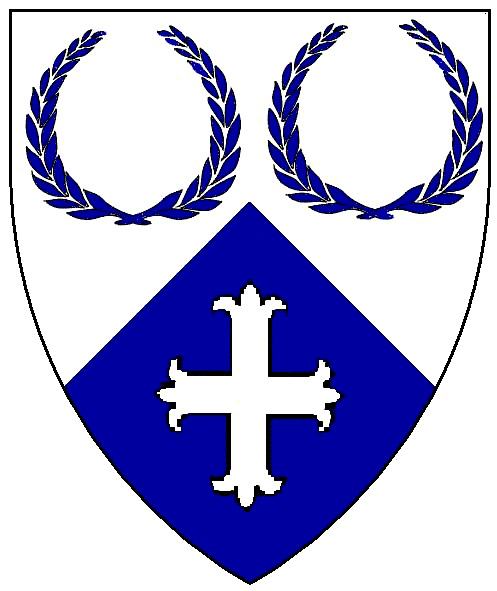 Arms of St Aldhelm, as rendered by Baron Master William Castille. The College of Andronicus is based at the University of Canberra, Belconnen, Australian Capital Territory, Australia. The Baronial Guard members serve for one year, and afterwards are made Pensioners (see Baronial Awards, below, for more information). One member of the Guard is usually made Sergeant. Baronial Guard regalia includes red leather baldrics with griffins stamped into them, on the back of which are the names of each Guard who’ve worn the baldric. There is also a Baronial spear that is carried by one of the Guard. The Politarchopolis championship tournament for heavy combat is usually held later in the year (October/November) and is run by the current Baronial Heavy-combat Champion. The Baron and Baroness choose a Champion from this tournament, who will hold the position for a year. The Politarchopolis championship tournament for rapier is usually held around Midwinter (May) and is run by the current Baronial Rapier Champion. The Baron and Baroness choose a Champion from this tournament, who will hold the position for a year. 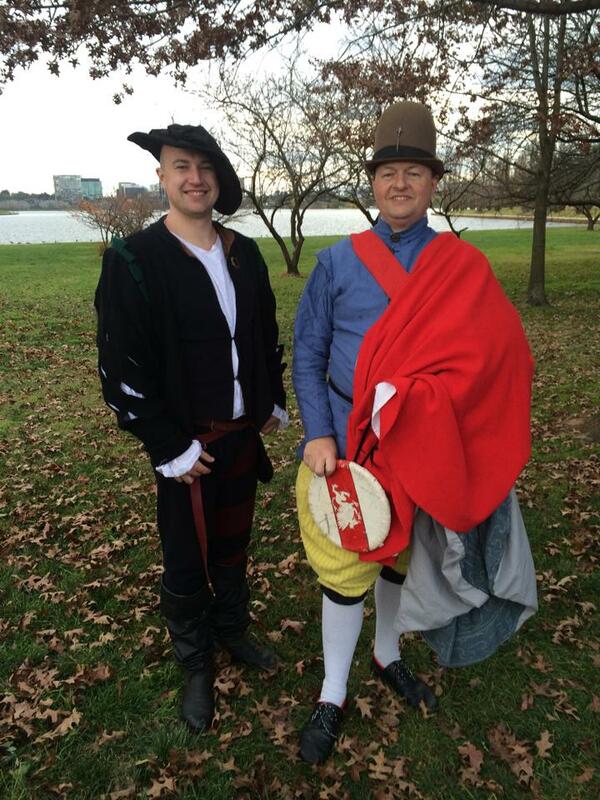 The regalia for this position includes a red side cloak and a buckler. Lord Clement Valentine de Spieler (left) and Don François Henri Guyon (right), outgoing and incoming Baronial Rapier Champions for Politarchopolis 2014. Don Francois is wearing the regalia for the position (side cloak and buckler). Photo by TH Lady Ceara Shionnach. The Politarchopolis championship tournament for archery is usually held over many Sunday shoots and is run by the current Baronial Archery Champion. The Baron and Baroness choose a Champion from this series of shoots, who will hold the position for a year. Each shoot is usually a different skill – for example, one may be an IKAC, one may be Royal/Kings/Queens rounds, one may be a blunts shoot and one may be a field shoot. Baronial awards are bestowed by the landed Barons and Baronesses, often in response to recommendations they receive from the populace. Politarchopolis keeps a Roll of Arms and a Book of Ceremonies online. This award was registered in 1996, and is given for excellence in service, arts and sciences, and arts martial – differentiated by the colour of the ribbon or cord from which the token is hung. The token is a pewter griffin segreant and the ribbons are white (service), green (arts and sciences) and red (arts martial). Award token for the Order of the Burley Griffin. Photo by Lady Merione French, 2014. This award is given at the Baroness’ discretion for exceptional grace, courtesy and chivalry. It is only given once a year and the token is a sun in his splendour in any medium, a symbol of Baroness Politarchopolis Mathilde whom established the award. The Order of the Cordon Rouge was registered in January 1996 and is the highest Baronial award of Politarchopolis. It is given by the Baron and Baroness to a person who has tied the Barony together, and is only bestowed once a year. The badge is a red mascle knot on a white field and the token can be in any medium, made by the previous recipient. In recent years, the token has been an embroidered pouch. 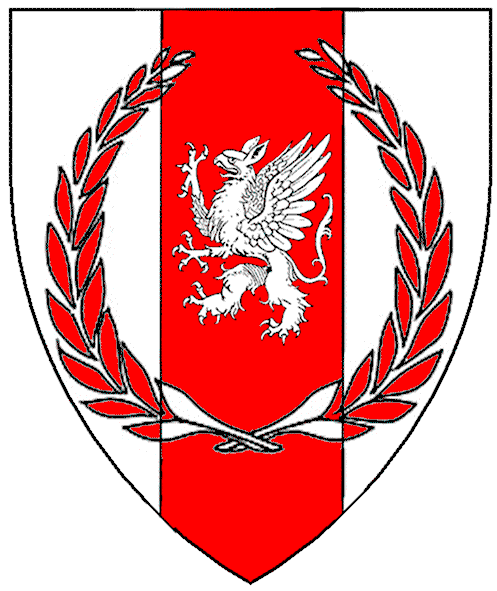 The Griffin’s Wing was registered in January 1996 and is given to those outside the Barony who have given great service to Politarchopolis. 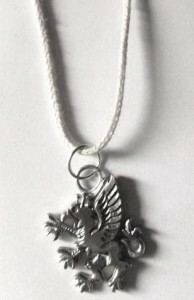 The original token was a red pouch decorated with a white wing, however, a pewter griffin’s wing suspended on a ribbon has also been used. The Griffin’s Egg was registered in January 1996 and is an award given to the children of Politarchopolis for their contribution to the Barony. It is given to children under the age of 16 and may be given for many fields of endeavour – for example, enthusiasm, politeness, skill or for lending a helping hand. The token is a metal griffin hatching from an egg, suspended on a ribbon of any colour. When a Baronial Guard member is stood down, they are inducted into the Pensioners of Politarchopolis. Once a year, traditionally at the Valentine’s event, the Pensioners are paid a stipend of twelve peppercorns and one gold coin (usually made of chocolate). The payment of the Pensioners was begun by Baron and Baroness Politarchopolis as a dig at Brennan, who was very young at the time. This award is given to combat archers. There is a banner, made by Lady Isabella Vitale, to which the devices of new members are added. There is also a horn, which is held by the Captain of Archers. This award is granted very rarely for an exceptional, one-time service to the Barony. Free Citizenship confers the right of free entry to Politarchopolis events for one year. Politarchopolis is renowned for the excellence and generosity of her cooks. The Cooks’ Favour was made by Baroness Politarchopolis, who gave it to her Champions, each in their turn. Feast of Saint Valentine: Every February, Politarchopolis usually holds an event around Valentine’s day. The format varies, however, it may include a feast, a pot luck, heavy combat and/or rapier tournaments, or target archery. Politarchopolis A&S Collegium: a relaxed weekend event of A&S classes with a feast on the Saturday night. Politarchopolis’ Fields of Gold (FoG): The Politarchopolis’ Fields of Gold is a weekend-long event that was first held on 16-18 December 2011. It was created and stewarded by Alesia de Cheval Blanc. The event was held again on 23-25 November 2012 and 29 November to 1 December 2013. The venue for this event is the Bungendore Showgrounds in New South Wales, and it has grown to be a large event (100+ attendees) in it’s short history. This event hosts activities for equestrian, heavy combat, rapier, archery and the arts and sciences. The event is typically fully catered and includes an opulent feast on the Saturday night. 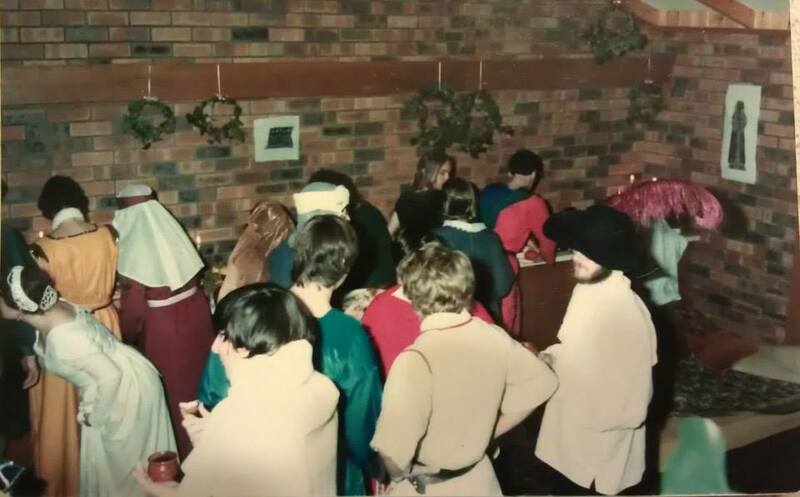 Saint Vitas: This event began as St Vitas’ Dance Weekend 1999, created by Lady Joanna of the Beechwoods as a sister event to the St Blasius Day Music Weekend. The event then consisted of 2 days of dance and dance related classes plus a Feast and a Ball somewhat casually in the style of Caroso. In 2006, when St Blasius was no-longer being held, Master Crispin Sexi convinced Joanna to include an additional stream of music classes, while she eventually convinced him to be the Steward in alternating years, and the event became St Vitas’ Dance and Music Weekend. St Vitas’ has been held every year since 1999, except 2003, the year of the Great Fire, and 2005, when the Known Worlde Dance Symposium was held in the Barony of Rowany. It is currently held in September at the Lake Tuggeranong Sea Scouts Hall.